The government says that more than 100 migrant parents chose not to be reunited with their children by Thursday's deadline. Lawyers who interviewed these migrants say they're on that list by mistake or worse. When immigration officials brought forms to H.G.A., a Honduran migrant who has been in immigration detention for nearly two months, he was suspicious. H.G.A., as he is identified in court documents, does not understand English, and at 51, he has vision problems that he and a lawyer say prevent him from reading in Spanish, a language he understands. He didn’t trust what the officials told him the papers said. So on three separate occasions, when officials asked him to sign a form indicating whether he wanted to be reunified with the teenage son who had been taken from him at the border, he “refused to sign the paper,” he said in a sworn declaration filed in court this week. “However, I made sure to tell the officials that I wanted to be reunited,” H.G.A. said in the declaration. H.G.A. said he made that point — my son “is incredibly important to me and we want to be together” — three times. And yet, H.G.A. ended up on the federal government’s list of parents who had relinquished their right to reunify with their children, according to Susanne Gilliam, a volunteer lawyer from New England who interviewed him last week in an El Paso immigration detention center. Hundreds of migrant parents separated from their children by the Trump administration’s “zero tolerance” policy are unlikely to be reunified by the court-ordered deadline today. The government claims that at least 127 of them chose that fate for themselves. But lawyers who have interviewed those migrant parents claim in a court filing this week that many of them, like H.G.A., have been placed on that “relinquishment” list by mistake or worse. In a court filing last week, the Department of Justice said 136 migrant parents were “ineligible” for reunifications or likely so because they had, in interviews with government officials, opted not to be brought back together with their children. That number, according to attorneys for the DOJ, dropped on Monday to 130, then to 127 the next day, and to 120 on Thursday. Some parents “may have changed their minds,” Sarah Fabian, an attorney for the DOJ, said at a Tuesday court hearing, by way of explanation. Lawyers for the American Civil Liberties Union have a different theory: They allege, along with a small group of other attorneys representing migrant parents, that in many, if not most, cases, their clients never intended to give up their rights to their children. According to new court filings, including testimony from lawyers representing scores of separated migrant families, more than two dozen parents were confused or even coerced during that process. “Many of these individuals indicated that they felt coerced into relinquishing their rights. Still others appeared totally unaware that they had done so,” Aaron Reichlin-Melnick, an attorney with the American Immigration Council, wrote in a court declaration filed this week as part of an ACLU lawsuit to order family reunifications. Reichlin-Melnick said his organization interviewed a total of 90 migrant parents, including 52 who had been classified as having waived their rights — but said many in that group had not intended to do so. The agencies involved didn’t directly address these allegations when asked by The Texas Tribune, but have laid out procedures that should have prevented such situations. Before families are reunited, immigration officials interview the parents to ensure that’s what they want, according to agency planning documents. Forms for electing to be deported without children must be read to parents in a language they understand, according to a spokesperson for the Department of Homeland Security. And the rights of migrant parents who have been separated from their children must be posted in English and Spanish in immigration detention facilities. But many migrant parents have said, through their attorneys, that these conditions were not met. 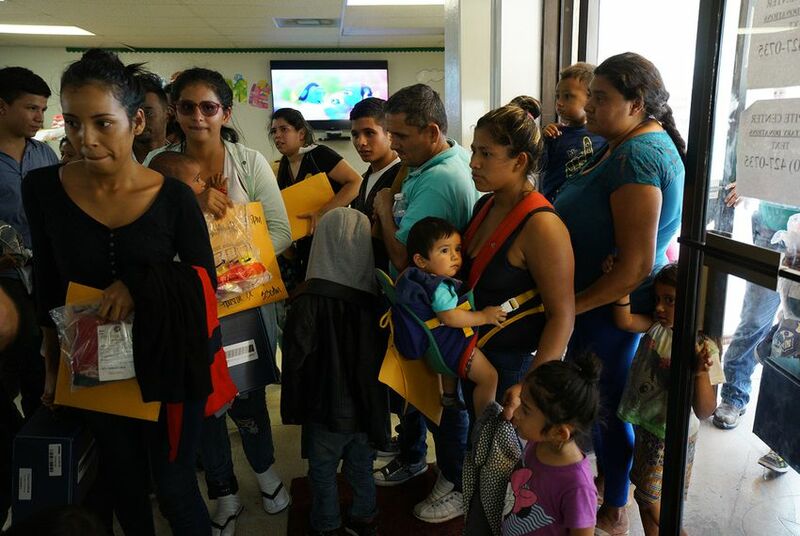 Many describe signing forms they did not understand, under extreme duress, often in groups of many dozens of migrant parents, all in a period of “no more than three minutes,” according to several court declarations. These difficulties are particularly pronounced among some Guatemalan migrants, many of whom do not speak English or Spanish, and some of whom are illiterate even in their indigenous languages. Charles Mwalimu, a New York attorney who interviewed two dozen migrants in two Texas facilities this week, said there were "zero — none at all" guards or translators able to communicate with migrants who spoke indigenous Guatemalan languages. "Without exception, there's no one who speaks those languages in those facilities," Mwalimu said in an interview. Many migrants, he added, didn't even get a Spanish translator. Luis Cruz, a New York attorney who volunteered in a processing center for migrant parents in New Mexico, said he interviewed five fathers on the government’s “relinquishment” list and found that all of them indeed wished to be reunited with their children. One parent said he was shown the form only in English “with no explanation”; he was surprised to learn he had relinquished his rights to reunification. One father “said that he was given a form, that it was not explained to him, and that the entire process lasted no more than three minutes.” Another said “the official intimidated him and told him where to sign, even though he did not know what it was he was signing.” Several described signing it in a large room with dozens of other migrants. “When [one migrant father] said he wanted to be reunified with his son, he was given a paper in English and told that if he signed that paper he would be reunified with his son,” Reichlin-Melnick wrote. That father has been placed on the “relinquishment” list, but he is “adamant that he did not agree to relinquish his right to reunification,” Reichlin-Melnick said. “He could not, however, understand the document because he is illiterate and no interpreter was provided to explain its contents to him in Mam,” Reive wrote. That father, she said, had been placed on the government’s list of parents who relinquished their reunification rights. More than a month ago, before a judge ordered family reunifications by July 26, migrant parents already described being told they would be reunited with their children at the airport if they agreed to be deported, waiving their rights to seek asylum in the United States. And this week, Politico reported that officials with the Trump administration failed to document consent from parents in most cases in which migrant parents were deported without their children. Administration officials, including the heads of both the Department of Health and Human Services and the Department of Homeland Security, have insisted that parents who left the United States without their children opted to do so, perhaps to leave a child with a relative in the country. But dozens of cases have now emerged in which parents put on the government’s list of parents who waived reunification rights assert they did not intend to do so at all. Many migrant parents, in fact, told their lawyers they wanted to be reunified with their children even if it meant being deported together to a dangerous home country.